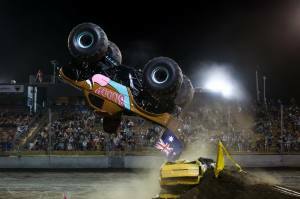 Saturday night will see 8 unstoppable machines return to Perth Motorplex for 1 night only, showcasing a huge exhibition of havoc an destruction plus a monster fireworks display for young and old. 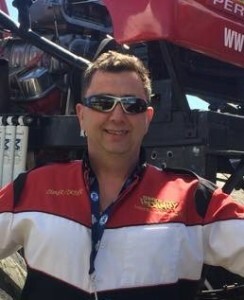 Saturday we will see Ged Barcroft creating havoc on Saturday night in beloved Monster Truck Buddy. Ged’s background makes him no stranger to heavy machinery joining the British Armed Forces at 16 qualifying as a Heavy Equipment Technician, spending the majority of his services working on armored vehicles, spending the good part of his service in Europe. All it took for Ged to get hooked was one show, after failing to convince his friend to sell his Drag car Ged sold his house and starter the journey to “SHEER INSANITY”. He named it this due to his mother saying it was sheer insanity to sell your home to fund this madness. May 2002, he suffered and brain aneurysm and was set back dramatically, by September he got back in the seat and did 2 shows in Vancouver. January 2003, saw Ged quit his job and take on racing full time, often doing up to 40 shows per year over several years. In 2010, at Monster Jam in Las Vegas, he was awarded Monster Jam Wheelie of the Year, this is the high light of his career thus far. January 2017, Ged lost everything due to a massive fire that tore through his property, destroying his workshop and both monster trucks and his mechanical repair business. Barcroft has spent 2018 re-building from the ground up and is now proud to announce that the new “SHEER INSANITY” is ready and waiting. 2019 is off to a very exciting start for Ged, first stop Australia, then onto Hawaii with the new truck, then spanning across numerous venues throughout North America.